New intelligence from the podcast sector proves the value of understanding context in delivering material that will entice evolving audiences in bold ways. Through the trustful relationship between listener and the voice they hear, advertisers are presented with an opportunity to drive greater engagement and cut-through for their brand. “The listener trusts the voice they hear and is actively engaged in the content that they have sought out,” he says. This, says Walkerden, presents an opportunity for brands to connect on a one-to-one level. Therefore, contextual creative is vital, material that can influence behaviour and drive action. A better understanding of listeners’ context, he says, “comes down to knowing your audience, their passions and how to engage with them, while at the same time being willing to take the risks required to access them”. Reaching these unreachables may mean marketers – for whom brand safety is always a concern – must be willing to place their brand in unexpected environments. “We have had numerous occasions where brave marketers have invested in a commercial podcasting opportunity and have reaped the rewards,” says Walkerden. In September 2017 a unique venture saw NOVA Entertainment come together with on-demand audio platform Acast to become the biggest podcast offering in the Australian market. The strategic partnership combines NOVA Entertainment’s audio dominance, radio heritage, creative production, and commercial and multichannel capabilities with Acast’s tech platform and pioneering expertise. Today, the partnership enjoys one of the largest podcast audiences in Australia at 6.4 million listens. Acast content director Guy Scott-Wilson says the selective opt-in nature of podcasts is marking a return to the traditional relationship between content provider and consumer, with podcast streaming apps and homepages replacing the newsstand as the digital gateway to great content. Scott-Wilson says it’s not always necessary to endorse a podcast to utilise its power. “One of the things that stands out about podcasting in Australia specifically, is that brands are buying into the medium through ads they record themselves and not relying on host-reads, as we see in other markets. For astute marketers – particularly those who understand their audience and what their passions are, and are able to engage with them to find out what they are talking about and why – podcasting represents a massive opportunity. “Everybody listening to a podcast that you have produced or sponsored is there on purpose. They have chosen to listen, and there is almost no wastage. In many ways this is better than any demographic targeting, because podcast listeners are so highly qualified and self-selecting,” says Scott-Wilson. Kate Murphy, director of commercial strategy at NOVA Entertainment, believes having the appropriate depth of insight is integral to good podcast planning. Bespoke branded podcast series achieve most success when the content is created with purpose and driven by a deep understanding of the prospective audience and what matters to them, she says. “While podcasting is proven to be an independently effective marketing or advertising channel, we’ve seen best results when podcasting is integrated as part of a wider marketing mix or audio strategy, with radio and podcasting being natural, highly effective partners.” Murphy believes in order to make the most of the niche audience the medium offers, a good branded podcast should be entertaining and engaging to the audience it’s targeting. Yet, while there’s ample evidence of the success to be had when podcasts go well, it seems the message is still struggling to get through when it comes to recognising the power of the medium. A recent report by the Interactive Advertising Bureau (IAB) found that while there has been a positive shift in interest around podcasting, 53% of media buying agencies had no experience in advertising with podcasts or no plans to use podcasts as part of their clients’ media mix. 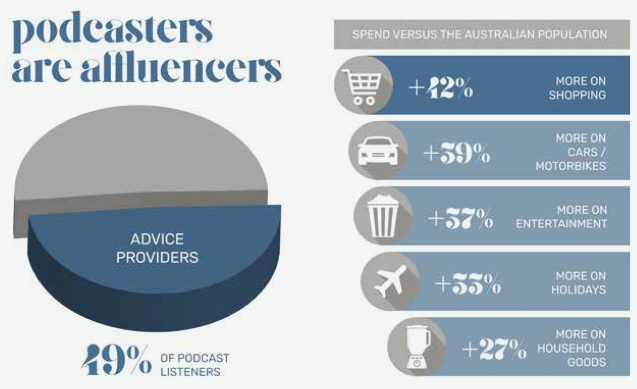 Conscious of the lack of local research available to assist buyers and advertisers, Acast and research group Ipsos produced a report attempting to deepen the conversation around Australian podcasting. Eager to not only look at the consumption of podcasts, but also investigate the value of the audience, its motivations for listening and the true value for advertisers, Acast and Ipsos utilised a sample of more than 1300 inexperienced and experienced Australian podcast listeners. The resulting report showed that podcasting has become the fastest growing on-demand audio medium, with 3.5 million podcast listeners from the ages of 16 to 64, representing one in four Australians. The ‘Podcasting Intelligence Report’ discovered that scale is continuing to rise, with 20% of current podcasters new to the platform over the past six months, and 21% of current listeners listening more than they were 12 months ago. 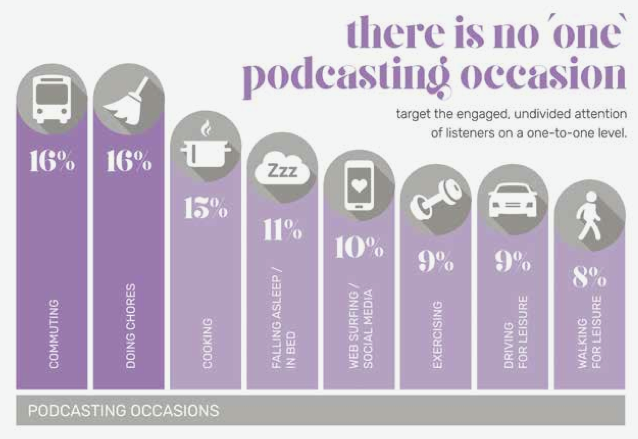 Perhaps more importantly, the report also showed that 49% of podcast listeners are more likely to influence those around them and have a higher discretionary spend on key categories such as retail, travel and entertainment. Advertising delivered by the podcast host was also found to be most effective in capturing audience attention and driving brand recall. Listeners are twice as likely to trust the message that host-read ads deliver, the NOVA Entertainment report noted. While it is clear influencers are a great asset when it comes to building engaged audiences, ensuring you do your homework is equally important. Murphy says the influence and intimate connection that podcast hosts have with their audience is well-known and the rise of podcasting has diversified a brand’s options significantly, including making global talent more accessible locally. While there is an array of options available, brands seeking to use trusted influencers for their messaging require a collaborative and experienced partner that understands their brand challenge and can connect them with the right voice talent for their specific requirement – which will vary dependent on the brand and campaign objective. 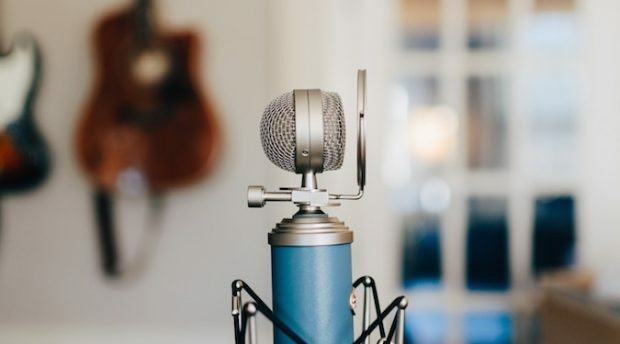 “Choosing the right voice for your brand story is key; however, of equal importance is the team of off-mic talent crafting your story and, importantly, making the connection between your brand and the prospective voice,” she says. Scott-Wilson says while there is no doubt the podcast audience is broadening, the typical podcast listener is “still a discerning one”. They have gone looking for great content, and so it needs to be authentic, credible and human if it’s going to resonate, he says. “Podcasting is a combination of content and influencer marketing, and there is one obvious quality that people look for in both: the ability to tell a great story. 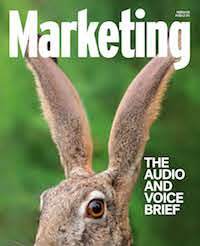 Yet while you can have the right channel mix, appropriate content planning and the right hosts, there are a number of areas in which advertisers can still stumble when seeking to make podcasts a part of their marketing mix, Murphy says. Podcasting is already a highly cost-efficient marketing channel, so investing an appropriate portion of your budget in quality production (both pre and post) is a wise decision and will multiply your return on investment (ROI). Distribution and promotion of the content you’ve invested in creating, is also paramount, she says.